China has flagged an even greater appetite for Australian dairy products and other goods as consumer demand surges for high quality agricultural imports from Down Under. Bank of China executive vice-president Gao Yingxin told a conference in Sydney this morning that Australia remains well positioned to feed China given its history of “riding on the sheep’s back”. “Australia is endowed with a mild climate, vast farmlands and fertile pastures providing unlimited potential for agricultural development,” Mr Yingxin said. Mr Yingxin said China’s appetite for Australian dairy products was a major focus in catering for the appetite of its rising middle class. “Between 2005 and 2013, the children’s milk market in China grew at an average of 28 per cent. Recently the adoption of a two-child policy will create even more business opportunities,” he said. More than 600 delegates have travelled from China for the China-Australia Agribusiness Trade and Investment conference, hosted by the Bank of China and the Australian Chamber of Commerce and Industry (ACCI). Around 240 businesses – 120 from China – and another 500 assorted attendees have joined Chinese media in Sydney. The carefully choreographed event is designed to bring small to medium businesses from Australia and China together to develop trade opportunities. Trade between Australia and China is estimated to be worth $150 billion a year. 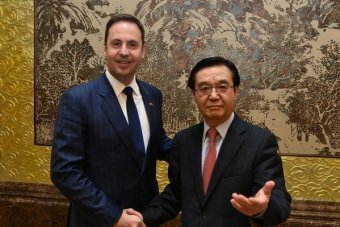 The Federal Minister for Trade and Investment, Steve Ciobo, said Australia has to adjust to the changing commodity price landscape to exploit even greater trade opportunities with China. “We know that in Asia there will be a six-fold increase in the number of middle-class people to the year 2030,” Minister Ciobo said. The focus on dairy exports comes as Australian dairy producers are hit by oversupply and falling prices. However, ACCI chief executive James Pearson said, while local farmers are suffering, the demand from China represents an opportunity for change. “For those that are able to do it, and have the confidence and capacity to do so, export does represent another opportunity, particularly for firms who are struggling at the moment,” Mr Pearson said. But dairy is just one sector highlighting demand from China’s middle class, which is becoming more choosy. Another area is demand for bottled water, which represents an opportunity for Henry Heng, managing director of the Refresh Group which is exporting water to China. “Most Chinese would drink bottled water, so it’s quite common for them to have bottled water in their hand but, as the middle class grows, a lot of them actually [don’t] mind paying a bit more for imported products,” Mr Heng said, adding, while it is still a niche market, there is a ‘fair bit’ of imported bottled water in China. Refresh has six plants in Australia and the company is listed on the stock exchange. James Pearson spoke to the “elephant in the room”, after the Foreign Investment Review Board’s recent decision to reject a Chinese bid to invest in Australian agricultural property. “The important thing to recognise is that Australia, as an economy more than most in the world that depends on foreign investment and foreign trade, needs to keep its borders open and we need to put out a very clear signal to the rest of the world that we are open for business, open for investment,” Mr Pearson said.